Sam: The Lone Peak is Altra’s best selling trail running shoe. It is also the best selling trail shoe in run speciality stores, and the best selling non Salomon shoe in outdoor stores. It is the most popular shoe for thru hikers on the Applachian and Pacific Crest Trails according to Altra and this preview article by Andrew Skurka here. Our reviewers have run previous versions of the Lone Peak (RTR review of the Lone Peak 3.5 here) and have noted that with each version Altra has carefully attempted to improve durability and lock down the sometimes loose fit, while retaining the distinctive soft, excellent trail feel. Read on to see what our testers thought of this new version. Also available in a RSM (Rain Snow Mud) waterproof breathable eVent upper version, review soon. Length: I found that the LP3.5 ran a little short. This seems to have been fixed in the LP4. Stretchiness of upper: The LP3.5 upper was made of a stretchy fabric that made the shoe comfortable, but may have been a factor in making the shoe feel a little unstable. When pushed to the limit, the upper would stretch, rather than hold the foot in place. Bridge across tongue in LP4. Purpose seems to be to stop foot sliding forward. Works brilliantly. Midfoot retention is exemplary. Graphics: there’s still a superfluous mountain graphic on the lateral side of the shoe. But whereas this was an abstract mountain-like zigzag on the LP3.5, on the LP4, the graphic actually looks like Lone Peak Cirque after which the shoe is named. I guess this is progress. Sole construction below heel is changed from conventional to Altra’s “Trail Rudder” heel flap. Seems to be softer, but I’m still waiting on someone to convince me this is a good thing. The last of shoe is basically unchanged. With the Lone Peak 3.0, Altra moved from an extremely roomy (some would say sloppy) toe box to a more moderately wide one. For me personally, this was a highly significant change, as previous Altra shoes had been limited to training only. The LP3 was the first Altra shoe where I felt the foot retention was good enough to use for racing. Dom: This is a trail shoe that felt instantly familiar and comfortable. The last feels the same as the previous generation of Lone Peaks: i.e. spacious, but not excessively roomy. Perhaps the most conspicuous feature of the LP4 is the new tongue bridge, a loop stitched across the tongue that the laces loop through. Whether due to this new construction or not, midfoot retention is excellent. Sam: Serious looking, with a Foot Shape toe box prior to trying on I thought, despite clearly showing more substance with all the overlays and massive lugs, that the 4.0 would continue the marginal foot hold and stability, especially at the heel, of its predecessors on anything other than smoother trails. My prior issues included rolling at mid foot, in the toe box and especially at the low rear heel collar with its tenuous hold and security at any kind of fast downhill pace. At easy paces, on all terrain they were fine and also made an excellent hiking shoe. These issues limited my use of Lone Peak 3 and 3.5. For trail running purposes, I actually thought the Torin 2.5 had a superior “trail upper” to either the LP 3 or 3.5. The first surprise was that is was a struggle to get them on. First good sign of progress. It took some work to loosen the sticky laces and spread the sides before I could wrangle my foot in. Struggle completed, the lace up was super easy, the upper wrapped with security yet without pressures from heel to mid foot. The subtly implemented, the red lace loops the only clue, substantial bridge strap between sides of the upper which actually runs through the tongue, was instantly noticeable, in a good way. I was well supported yet with at the same time a more than adequately comfortable hold No minimal upper here, lots of old school stitching mixed in with some laminated overlays. David: My first thought when getting the LP4 was that it really looked and felt like a hybrid with the Superior 3/3.5. The last shape and design (and fit, finally true to size), including upper material were similar. The LP4 definitely went more robust on the overalays and outsole but lots of similarities remain to the Superior. I’ll get into more specifics below. Dom: Whereas I had felt that the Lone Peak 3 and 3.5 both had length issues, the LP4 was true to size. The fit of the LP4 is apparently also tweaked to be slightly narrower than the LP3.5 in the midfoot and heel. While the effect was subtle, mostly subconscious, the LP4 felt more secure and a better match for my narrowish heels. Sam: Fit was true to size with medium trail weight socks. My only minor fit concern is the substantial stitched on toe bumper. I could feel its raised edge bumping into my big toe on downhills when wearing heavier socks. David: True to size (finally!). Somewhat more secure than the 3.5, but overall a pretty roomy, comfortable Altra experience. While the fit is improved for me there is still some lack of security in the right places. The midfoot/instep in particular, while robust, somewhat surprisingly just doesn’t offer much structure. Dom: The upper of previous iteration of this shoe, the Lone Peak 3.5, used a stretchy fabric. This made the shoe very comfortable, but the amount of stretch compromised the stability of the shoe. When pushed to to the limit, the upper would stretch rather than hold the foot in place. The LP4 ditches the stretch fabric for a more conventional single-layer mesh. The new mesh looks to be a good compromise. It feels light (so may feel cooler in hot weather than the 3.5), and also tough (the LP 3.0 had notable durability issues), while also retaining a little “give”. Sam: I agree with Dom. Removing some stretch in the upper has improved support overall. I wish given the lower stretch that the toe box at the lace up was a touch lower height as I sense some foot roll in that area when pushed. The front stitched on toe bumper on the other hand while pliable has 2 rows of stitching and is thick. I felt some pressure on the my tricky big toenail in that area. A smoother interface between upper and toe bumper would be an improvement for me. David: Agreed that the upper material switch was a good move. A little baffled at all the heavy/thick stitched overlays honestly though, especially when the result feels actually less secure than the Superior which has very minimal stitchless overlays and a similar closed cell mesh. Dom: Midfoot retention and stability is improved over the 3.5. This may be due to several factors: the new upper fabric; the strap across the tongue; new ‘V’ shaped exterior overlays connecting the laces to the sole on the medial side; or slightly narrower fit in midfoot and heel. I found that toe bang was completely absent, even on the steepest descents, and stability (in terms of ability to react to and counteract ankle-rolling) was about as good as it can be with a 25 mm stack height. Sam: Dom has described all the improvements to mid foot retention and support. While many modern shoes have done away with stitched on overlays here I think the thickness and relative rigidity of the midfoot overlays is a plus, although I imagine they add the noted weight, as they provide support yet at the same time no under arch pressures. David: I concur with the Dom and Sam on the descriptions of the overlays and approach Altra took with the shoe and while I’d agree it is better than the 3.5, it is still a ways off where I’d want an all day ultra/long run shoe to fit. Overbuilt for the result in my view and does seem stuck back in time a few years as far as construction goes. 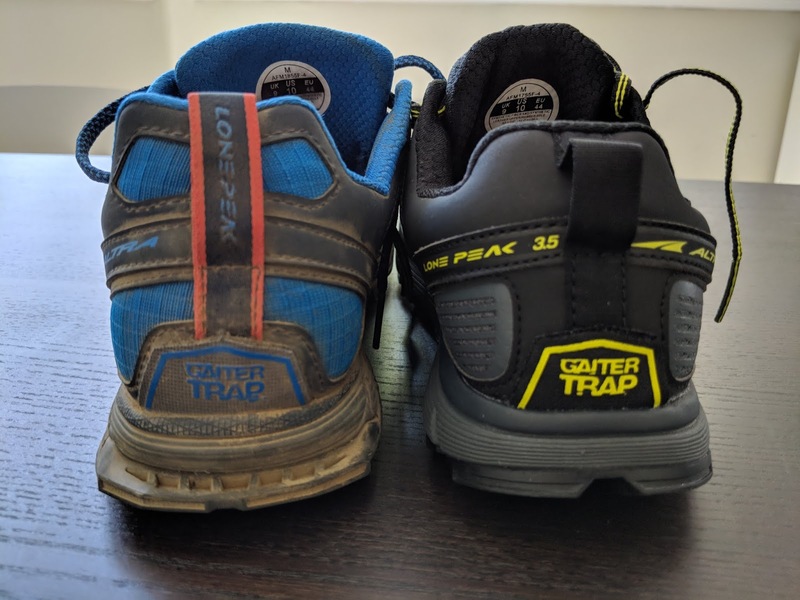 Sam: I also appreciate the 4 points of attachment for Altra gaiters: hook at the front, overlay loops at both sides near the sole at mid foot and velcro at the far rear. The new strap connecting the two red lace loops through the tongue is notable in its effectiveness and is not noticed on the run. The The strap is of the same width as the lace loops extending across the tongue between the two loops. A black gusset starts at the red loops and connects the tongue to the top of upper forward. Unlike many such mid foot strap support systems, including Altra A's frame in the new Torin, in my sample it does not extend from laces to midsole along the sides of the upper as an A but I suppose the exterior medial overlay could be called an inverted A. The two red loops connect across through the tongue. It completes a sort of a mid foot “cage”, with the added bonus of no tongue rotation possible but is not noticed in terms of any pressing on the instep when laced as it is really independent of the lace pressure. The non slip flat laces complete the system and don’t need to be over cinched in combination with the rest of the system to provide very good support. I have almost never had to re tie on the run. David: The heel is definitely an improvement on the LP4 and the area that I think is actually most improved with very little drawbacks that I could find. 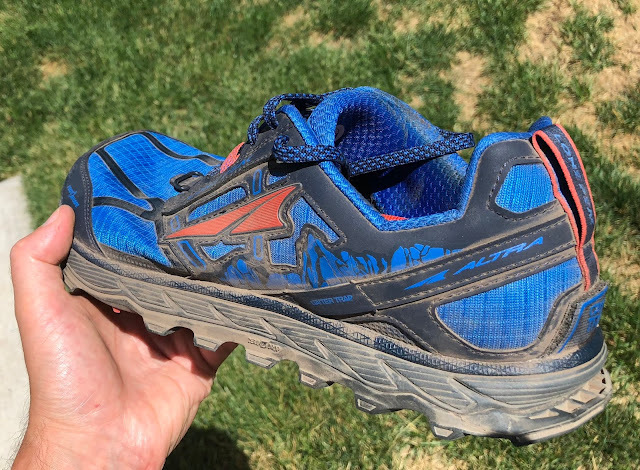 Dom: You really cannot tell it by hand-flexing the shoe, but there is apparently a rock plate, Altra's Stone Guard sandwiched under the forefoot of the Lone Peak 4.0. Any rock plate has to strike a balance between protection from penetration of sharp rocks and ground feel. In the case of the LP4, ground feel is superlative, but the compromise is perhaps tipped too far in this direction. Rock protection is only so-so -- so much so that during testing I wasn’t even aware that there was a rock plate in the midsole. The Stone Guard rock plate resembles the skeletal structure of the foot I think as Altra has made the plate so flexible that it barely functions as a rock plate any more. Sam: The Lone Peak 4 has a notably soft midsole yet in combination with the outsole and upper plenty of stability and trail feel as Dom notes. This is one super comfortable midsole outsole combination and I found, despite the weight. that LP 4 is very accommodating and fun to run on the roads, more so than what I recall as the firmer 3.5 and for that matter most trail shoes. I too felt some rock push through, or let’s just say rock conforming feel (that part welcome) in the LP 4. The protection is not of the “no question there is a plate here” but more subtle in part I think due to the soft midsole also deflecting under sharp pressures. At my more moderate paces than my colleagues and as a long trail hiker the protection is fine. This softness also contributes to a touch less forefoot stability than I prefer in combination with the voluminous front upper near the front laces. David: Dom hits it on the head with the midsole. While I enjoyed the very natural and flexible feel of the shoe. There is very little rock protection especially considering how much stack and weight is here. I had multiple hits on rocks that really got my attention. I’m guessing the outsole rubber softness, midsole softness and very flexible ‘rock plate’ insert are what contribute to this. 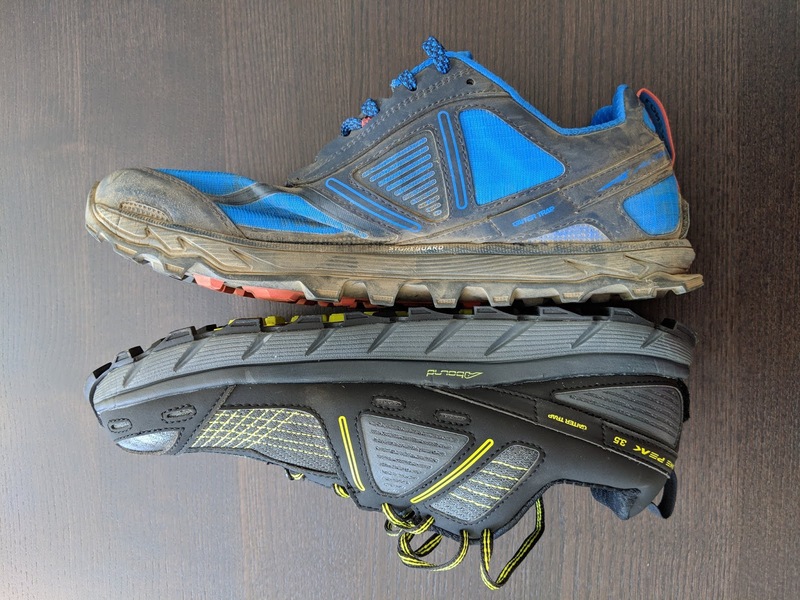 For me, the shoe is only really enjoyable on moderate trails, but that’s where the problem with the robust lugs and extra weight come in, not to mention that the Superior honestly has as much or more rock protection. Dom: Visually, there’s little difference between the TrailClaw outsole of the LP3.5 and LP4. However, the formulation of the rubber has been changed to MaxTrac to improve durability and wet grip. In the heel, and forefoot the new lugs are more directional, and there are small hexagons cut through the outsole at the forefoot as well as at the heel (for increased flexibility and weight reduction?). Underfoot, LP4 midsole thickness is reduced at the sides, giving a bevel to the outsole. In this area, lug depth is increased to keep ground contact flat. If you look closely, you can see that the tread pattern and shape of the lugs has been tweaked. Additionally, there are invisible changes like a graduated thickness, tapering in the toe box to improve flexibility.Personally, I was not able to find wet conditions to test the grip of the LP4, but had no complaints over a variety of dry ground types. Sam: I too haven’t found much wet to test but on dry surfaces both soft and firm the grip and comfort is outstanding. Very little harsh shock or awkward slap is transmitted in comparison to many trail shoes hinting to me in addition to the very commendable flexibility of the Lone Peak that the rubber here is quite soft and/or the lugs have a well designed deflection under load. The more pronounced rear rudder is welcome as it softens initial landing. David: I like the new outsole overall. It is softer, more responsive and grippier than previous LP outsoles. It is a bit overkill to have such large lugs on the medial midfoot (really that part of the foot shouldn’t be touching the ground most of the time and you don’t weight it much right under your arch). Overall though, the outsole is a big improvement, it just needs to be a bit a more protective over a slightly firmer midsole on top of it along with a bit more security in the upper to take advantage of the aggressive lug. Dom: The overall experience of trail running in the LP4 was outstanding. This was a shoe that felt like a perfect match for my foot, and did everything well. The ground feel was class-leading, while providing decent rock protection. The shoe felt lighter and more nimble than its actual weight would suggest. Sam: The LP flows along very smoothly regardless of terrain with its overall stability (due to upper changes) now making it a more technical terrain shoe for me along with of course still a smoother trails and even roads cruiser. The trail ride is just right for me, soft enough not to be punishing, decently protective and flexible to terrain and pace. It is not a shoe even slow old me would race to technical terrain taken run hard, but is ideal for longer easier days on the trai, runs combining road and traill and hiking. I do wish it was lighter and the forefoot lower in overhead volume so it might gain in agility, which while commendable is somewhat bogged down. David: Agree with Sam and Dom that the LP4 runs very naturally and nimbly (almost like minimalist shoes back in the day). It does run pretty smoothly for the weight and lugs. On smooth trail it does not run as heavy as it is. I liked everything about the Lone Peak 4.0 except the weight. At 648 g per pair (11.4 oz per shoe), in my US M10 size, these feel at least an ounce too heavy. That makes them a stellar training shoe, and one that find myself grabbing for daily runs. But on race day, I’m likely to pick something else. Hoka Speedgoat 2 are 54 g lighter (per pair). Brooks Caldera 2 are 47 g lighter. Topo Terraventure are 44 g lighter. Even the Lone Peak 3.5 are 30 g lighter. Hopefully in the long term, the extra weight of the LP4 will be justified by extra durability compared to the competition. And at this weight, I thought rock protection could be better, but the flip side is that trail feel is amazing. Otherwise, there’s almost nothing to quibble over. The Lone Peak is a shoe that has iterated through many versions, and its long pedigree shows. The 4.0 version should please almost everyone, even those who generally dislike the Altra wide toe box and zero-drop platform. Dom’s Score: 9.3 out of 10. -0.5 for weight. Huge deduction here. I just couldn’t get past the fact that this otherwise outstanding shoe was a lot heavier than it should be. -0.2 for balance between trail feel and rock protection being skewed toward the former. Not much differentiation between Lone Peak and Altra Superior. I would expect Lone Peak to offer significantly more protection. Overall the Lone Peak 4.0 is a bit of a mystery for me. Altra clearly is listening to feedback and addressing some of the issue with the LP3/3.5, but somehow the shoe feels really disjointed and not standing out from their other offerings much. To me if you like Altra’s fit (and I generally have had my problems) the Timp and Superior fit the bill for protective and lighter trail shoes respectively much better than the LP4 which sort of straddles the two areas and ends up somehow feeling less protective than the Superior in my opinion. I ran one 23 mile run with moderate rocks and my feet were more beat up than many other shoes in the 8-9 oz range that I run in these days. For what the Lone Peak is (11.5oz shoe) rocks should not be a concern. The fit/true to size is a big improvement and the heel hold is also a step forward. I like the general direction of the outsole as well, but it just doesn’t all come together to form a cohesive shoe. It’s hard when you try to create the goldilocks shoe and I’ve always felt the Lone Peak was one of the models best positioned to do just that, but for me, I’ll be looking to see how they can tweak it for v4.5. -.5 for weight. Much too heavy for the level of protection offered here. -1.0 for lack of rock protection. This is a deal breaker for me with a shoe of this weight and beefyness. If I can run a normal long run in it without worrying about rocks, I can just go and find shoes 3 oz light that will provide the same protection and a much more snappy ride. Even if your feet can only tolerate Altra’s for some reason, I’d suggest the Superior 3.5 over the LP4 any day. Sam: The Lone Peak 4.0 refines Altra’s philosophy of a Foot Shape toe box and Zero Drop and applies it to a softer trail riding shoe with now improved any terrain, stability and support, grip and comfort. Previous versions were for me too unstable at the heel and loose in the upper when pushed. The new midfoot upper construction and higher ankle and achilles hold have made a big difference. 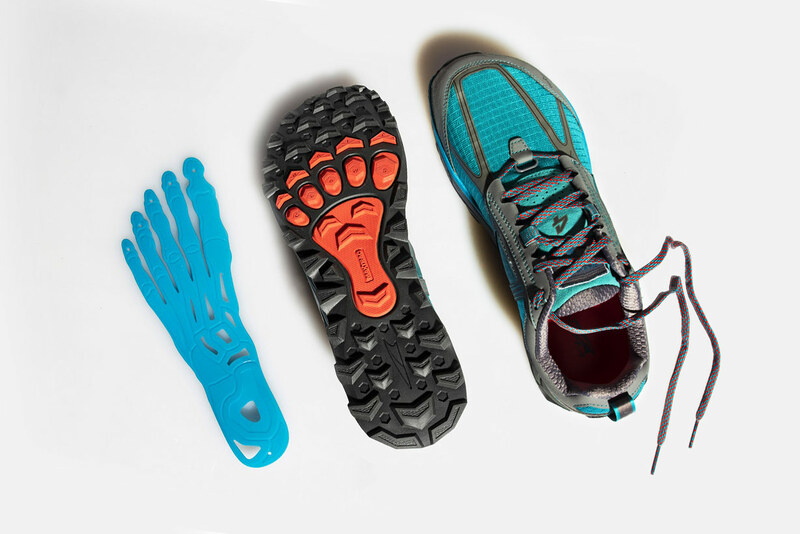 I do still wish for a bit less vertical volume or an additonal overlay at the front of the laces up front to lock down the foot, the new expanded bunion windows may be overdone for my foot, while retaining the Foot Shape and width, or a slightly firmer midsole or more substantial Rock Guard plate. I am still not as secure up front as I would wish, but getting close on uneven terrain at faster paces when the foot twists in the shoe as the soft foam deflects below. All of this said, this is he best Lone Peak to date. It should continue to be a best seller for trail running and long distance hiking as the 3.5 was for its superior overall comfort and soft yet decently stable ride. -0.4 for weight. The outsole could be slightly lower profile and the upper overlays slimmed down to get there. -0.2 for still some work on the upper. The toe bumper overlay could be better integrated and slimmed. While pliable it is thick and stitched over the toe nails. Some reduction in vertical volume close to lace up might improve front foot hold and the ankle collar beefed up a touch more yet. -0.2 a slightly firmer midsole would improve response and rock protection as well as stability. Dom: The Lone Peak 4 improves over the previous LP3.5 in a number of ways: better breathability; improved stability and midfoot hold; (reportedly) better grip in the wet. Downside is heavier weight by ½ ounce per shoe. Sam: I concur with Dom. Dom: The Caldera 2 provides much more protection from rocks than the Lone Peak 4. Although the Caldera 2 got almost everything right, I personally felt its big flaw was that the sole was too stiff. Ground feel in the LP4 is vastly better. Sam: I concur with Dom, stiff and not as much fun to run on moderate terrain with a a lot of rock protection. On the plus side it is just under 10 oz whereas Lone Peak is 10.6 oz. I do think the Caldera 2’s upper balances comfortable room with foot hold a bit better for my narrow medium foot than the Lone Peak’s. David: Agree 100% here. Superior 3.5 and LP4 are nearly the same type of shoes. For me S3.5 is the better fit/feel. Dom: The SG2 is lighter, and has far more rock protection than the LP4. The protection provided by the SG2 makes it a better choice for (say) a 100-mile mountain race Conversely, the LP4 offers far better trail feel and a more pleasurable running experience that makes it a much better shoe for daily training. Sam: Take the Lone Peak and super size upper volume and cushion and you have the Timp. While super fun and cush to run, the yet heavier Timp’s very unstructured upper and its huge volume does not inspire confidence on steeper rougher downhills. Best for long slow plods. Sam: The Lone Peak upper is just a bit more secure for me at mid foot than EVO’s unstructured Kevlar thread MATRYX upper over its higher midsole stack. Underfoot, the Lone Peak is softer, maybe a touch more agile and with better soft terrain grip. This said if trail and even road speed with lots of firmer cushion is your game the significantly more responsive EVO is in the end a more versatile option, although a $50 pricier one. Dom: In many ways, these shoes are so different as to make the comparison absurd. The LP4 has a lower stack height (officially 25 mm flat, vs 29/33 mm in EVO Mafate) but feels lower still and is much more stable. The LP4 runs like a more minimal shoe, with tons of (arguably too much) trail sensation, whereas the EVO has remarkably plush cushioning. And then there is the much wider toe box of the Altra. Sam: The Ultra Pro is somewhat firmer overall and is more stable upfront with somewhat better if firmer feeling rock protection. It’s upper volume up front on a narrower fit approaches the Lone Peak and ends up more secure there, lagging Lone Peak at mid foot but securing the heel area a touch better overall. It It is not quite as much fun to run, a bit thinner and stiffer feeling but is a solid higher drop shoe also designed for long miles at moderate paces. David is a entrepreneur, endurance coach with CTS (https://trainright.com/coaches/david-henry/), husband and dad to 3 children. He has run distances from short road races up to mountain 100 milers totaling around 40 ultramarathons over the last 8 years. Searching for the best tools for the job, his interests turned to shoe design and real-word application of that design in many conditions, including those as harsh as winter in Alaska. Sam is a 1:38 half marathoner on a good day and didn't mind at all going into his 60+ age group in 2017. Update: maybe he can still run fast as he clocked at 1:35 recently and a 3:40 Boston Marathon qualifier, surprising him. He runs approximately 40 miles per week along the New Hampshire Seacoast and on Park City, UT trails . He has been running for 45 years and has a very dated marathon PR of 2:28. More aggressive outsole than previous versions which is a plus, but the upper reminds me of Speedcross 4 which means, no breathability. Any thoughts on this shoe vs the Torrent? I’ve been running in Salomon sense Pro 2s and then the Hoka Challenger 3s and want something between those two extremes. I felt like the Altra Superiors would be too firm and the Timps are super heavy. Softer, heavier and more roomy for sure with better grip than those others. A most comfortable cruiser the LP4 The Torrent is superb and would fit between Sense Pro 2 and Challenger with better grip and a touch more room. Both Challenger and Speedgoat are in my view kind of dated designs in comparison to Torrent and EVO Mafate. Thanks for the advice. My hesitancy with the Torrent based on reading your reviews has been toe bumping... I have a slightly longer second toe. Has that been a long term issue? The intrigue with the LP 4s is the zero drop. I've been running in the Escalantes on the road and love them. But, I've also road run in the Hupana and Kinvara 8s too. No further issues with toe bumping although the fit is broad. Strangely broad yet secure at the same time. Ok, thanks for the feedback. The reviews are really helpful when picking out my next pair of shoes. True to size for me with Lone Peak 4. Any bigger and I would be swimming around in them. If you wear super heavy socks and mostly hike maybe size up a half. How's the size compared to Lone Peak 3? Longer / shorter? LP3 is suitable for me at size 8.5, what size should LP4 be suitable for? It’s what I’ll call the “ALTRA HERE WE GO AGAIN!” A company makes a great product, but between quality control and sizing issues they just can’t seem to pull it together. Pulled my new LP 4.0s out of the box (in the “hell yeah” yellow) and was stoked. Stickier rubber? Check. More badass looking? Check...because really the 3.5s were not cool. Slipped them on. Locked down heel? Check. Midfoot craddled nicely? Check. And then...HUGE. It’s like a reoccurring, bad dream. I’ve worn both the Superiors and Lone Peaks, since their 1st versions and every time I have to play this guessing game. In the LP 3.0 I was a 10 and if memory serves (they are gone) I couldn’t have gone down a 1/2 size...then in the LP 3.5 I was a 10.5. After reading online that people were having to size down 1/2 size from the 3.5, I figured I’d be safe going back down to my size 10, which up until the WTF sizing of the Superior 3.5, has been my Altra size over the last few models. Nope. The 10s were huge up front (even for Altra), over a thumb and a 1/2 space with my normal medium weight socks. WAY to long/roomy even for Altra. And as I started really testing laces, they were beginning to touch, especially in the new mid foot lace thing. So, I’ve ordered a 9.5, a size I don’t think I’ve worn in Altra and hope when they arrive that I’ve nailed it. The paranoia of an Altra sizing defect almost had me order an alternative 10 to try, but I refrained. Fingers crossed...something you shouldnt have to do when choosing shoes. So my recommendation is to go down a half to a full size from your 3.5 size. Maybe I’m really a 9.5? Maybe I don’t understand how Altras are suppose to fit after all these years? How much space up front do you all recommend? I have wide feet so I like the width, but don’t sleep sloppy up front. Good review! Sorry but if I missed this in the review, but if you compare the flex of the sole of the LP 3.5, is it stiffer? I just sat down with a pair of LP4.0 and LP3.5. Sole of the 4.0 is slightly more flexible. Under midfoot and heel, the difference is quite noticeable: 4.0 is distinctly less stiff torsionally. Under the forefoot, the two are closer, with the 4.0 a hair more flexible. I appreciate the feedback. I prefer a more flexible sole so this is good news to me. I prefer a more flexible sole, this is good news for me. So far the 2.5s have been my favorite but I'll check these out. I'm going to Glacier National Park and will be doing quite a bit of hiking. Would you recommend these for a rockier terrain? The last thing I want is a rock puncturing through the sole, but I have a wide foot and Altras are SO comfortable! If you don't think these would be a great choice for that type of surface, do you have any other recommendations? The Lone Peak 4 would have decent rock protection given its foot shaped toe rock plate but might not be as rock proof as some others but suspect for hiking would be just fine. It would very unlikely rocks would punch through the sole but you might feel some if you land on pointy ones. You might also look at the Altra Olympus. We have not reviewed but it has a yet greater midsole thickness. What about wet rocks? LP4 not slip? In the review, I did not find mention of this. I prefer the upper of the Olympus 2.5. Much more breathable.